At D Music & Design Services, we do not have a standard website design format. All our sites are created specifically for the individual client, to meet their needs and to reflect their business or activity. 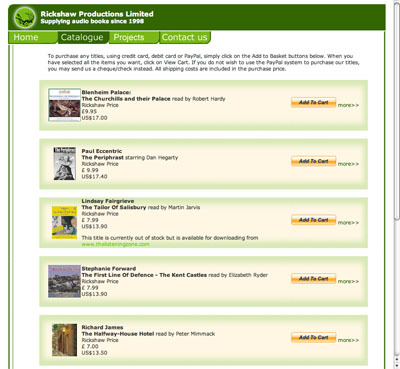 The samples below give you some idea of the range of websites we have created. Ian needed a site that promoted several aspects of his music career. 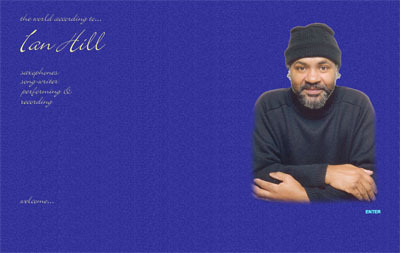 The site has grown since its first design, as Ian's musical projects have widened. 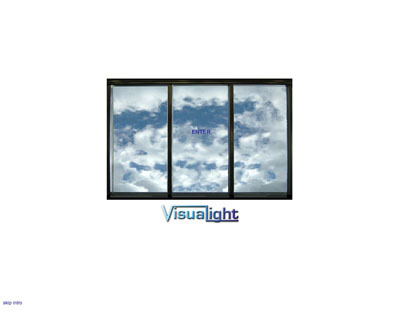 The original showcase site includes several samples of Ian's music that can be played from pages dedicated to each of the albums he has performed on. It has now been expanded to 17 pages to include videos produced for two of Ian's bands by MidMedia. Go to the 'New for 2008' section to see the videos. This site was designed to promote EXIT connect UK's services enabling people to book transport and accommodation online, but also to provide general information about the EXIT festival itself, and the whole experience of getting there and being there. It specifically targets festival goers from the UK. By providing such a helpful site, based on their own experiences, the company are giving site visitors reasons to return to their site and to trust them as an organisation. This site requires regular updates during the run-up to the festival itself. 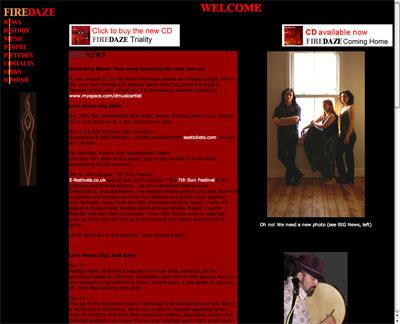 Firedaze wanted a site that would promote their live gigs and their recorded work, that could be regularly updated with news and gig dates. This site has been up for a long time, and although the design basics (Flash screen to start and frames on the pages) are generally no longer recommended, the site still achieves what it was intended to. Chris' new website has been designed by Duncan Arrow. Based around a Word Press theme the site has been designed to be easy to update with new content and so improve on its Google rating. 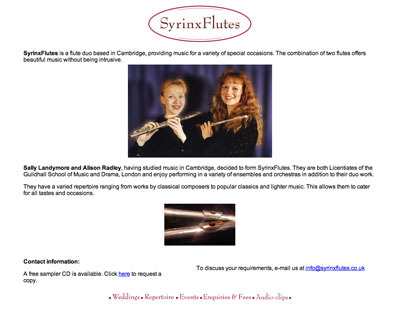 The appearance of the site has been kept simple in order to make audio samples easy to find. 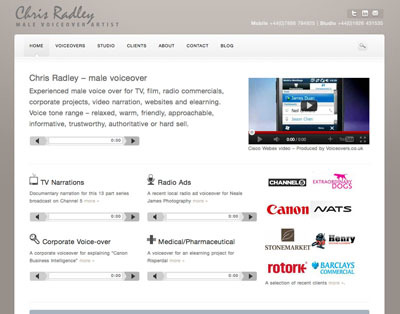 At the same time client logos visually indicate clearly and simply to potential corporate and other clients the sort of voice work Chris can do. The site can now be constantly updated by Chris to refresh the content, keep his client list up to date, and add new posts to his blog. 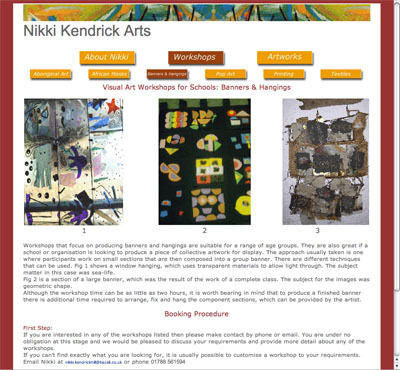 Nikki's site was designed to promote her business as a workshop artist for schools and other organisations. 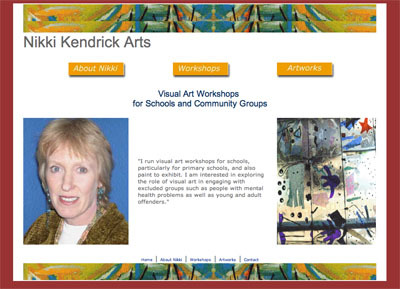 It includes her own and her workshop participants' art works. The design was chosen to stand out from the crowd, and to be easy to navigate for busy teachers trying to research in their lunch breaks. 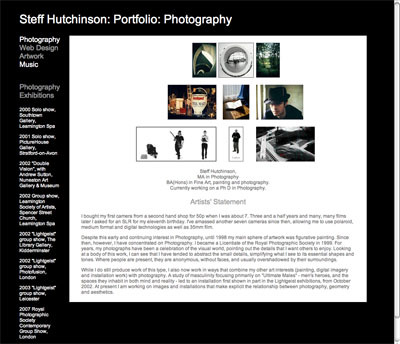 This is the personal site for one of our designers. 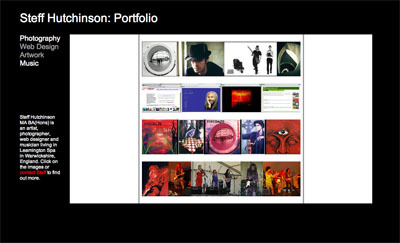 It showcases Steff's photography and design work as well as linking to her music site. Its aim is to act as an online CV to enhance applications for exhibitions or commissions. As such it's image-heavy without being cluttered. 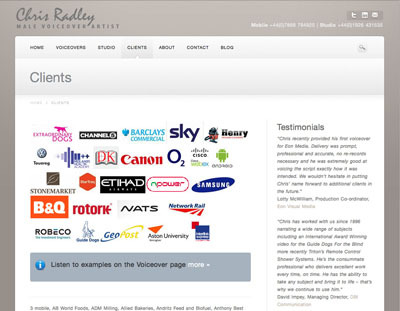 The clients needed a site to promote their singing academies and individual vocal tuition, allowing potential students to register online. The colours were chosen by the customer to give a vibrant feel to their business. The site has been designed to be expandable to allow for the company's future showcase projects. This is our sister site, and so the colour scheme and design were selected to reflect this site, and yet obviously be something different. 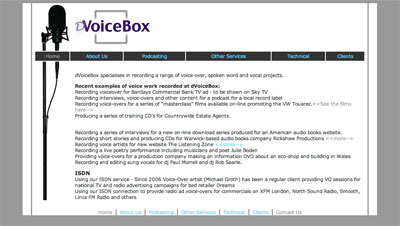 The aim is to promote the recording studio to potential clients, emphasising that the studio specialises in recording the voice, spoken or sung. The strong graphic element was created with this in mind. 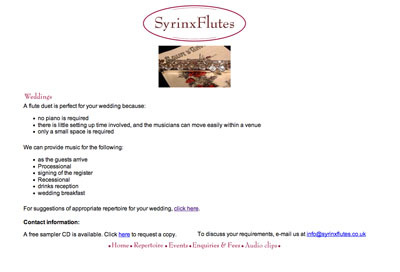 The two musicians wanted a 'shop window' to promote their duo, with wedding planners and brides-to-be specifically (but not exclusively) in mind. 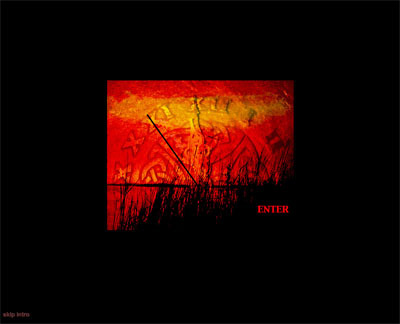 The designs and colours were chosen to reflect this, and there are a number of samples of music so that potential clients can hear what the duo sound like before they make contact. We provided all the photography as well as the website design. 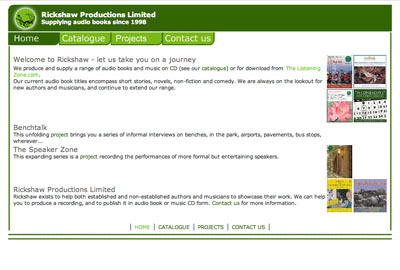 This retail site was designed to sell CD copies of the company's audio books. It was set up so that customers would use Paypal, recognising that this method of payment is trusted by many internet users. The site owner has now switched to downloads only, so the site is no longer live. 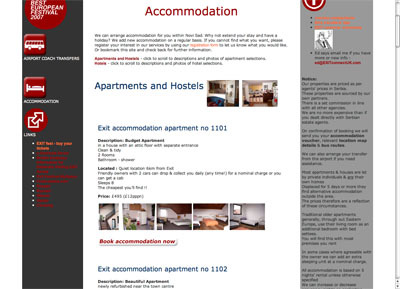 This company required a brochure site to establish their presence and promote their business. 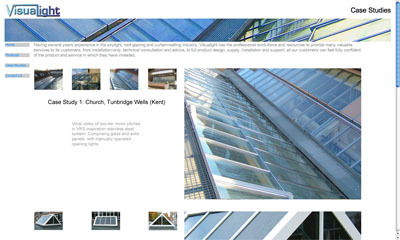 The site was deliberately image-intense, so that prospective customers could see the quality of their previous work. The images were all provided by the client, but we enhanced them before putting them on the site by removing unneccessary distractions.